A nice little ramble in the environs of Hampsthwaite, a village in Nidderdale, on a variety of field, beckside and woodland paths. With my walking plans for the weekend thrown into disarray by a combination of a poor forecast for the Dales and some pain from a recent tooth extraction I decided to do a more local walk. In this case I chose Hampsthwaite, a village that my family, on the maternal side, has a long connection with. The main aim of this walk was to finally visit the Mount Pleasant trig point. Situated just 1.5 miles from where I’ve been living for the last six and a half years it had so far escaped my attention. So that the walk wasn’t too short I came up with this route that does a kind of semi-circle to the south of Hampsthwaite. Parking on Church Lane, just above the Church of St Thomas a Becket which I was leaving for the end of the walk, I left the village by a path heading east alongside Cockhill Beck. Some early morning sunshine which had promised better weather had already disappeared and there was a haze, even looking across the large field to the left of the path and beck. On reaching the second footbridge I crossed Cockhill Beck to take a path alongside some trees which afforded a brief view of the River Nidd. Passing on the outskirts of a well hidden sewage works I joined a track that connects Crag Hill Lane and Myers Green Lane. Turning right I walked up to Myers Green Lane where there was a lovely combined display of snowdrops and winter aconite. At the end of the lane I turned left on to Lunds Lane, passing some nice houses, before crossing the road to take the drive up on to Knotty Ash Farm. From Knotty Ash Farm I navigated my way across a couple of pastures, crossed Chain Bar Lane and went up the drive of Shutt Nook Farm. Circling around the back of the farm there was a very scrappy section leading to the trig point. Signposting was almost non-existent and in the summer I imagine that the stile in the hedge above West Lane Farm would be very hard to spot. Having walked right past it once I eventually found the trig point. With a wall on two sides, scrub on another side, and the top wrapped in barbed wire, the trig point is well hidden. While it was hardly the most aesthetically pleasing trig point I’ve visited the sun did at least begin to break through. In fact I was to enjoy warm sunshine for much of the rest of the walk. This was initially across grassy pastures to Rowden Lane. Along the way I crossed a couple of awkward double stiles that were separated by the top of a wall. Having crossed Cockhill Beck I climbed up to Hampsthwaite House where a large notice above the door proclaimed, ‘This House was Rebuilt by John Smith in the Year of our Lord 1784’. Crossing Grayston Plain Lane I took the short-lived Swincliffe Lane up to an attractive junction of houses at Swincliffe. Turning left a short way along the road I then took a path on my right across fields to Gormire Wood. The subsequent descent through the woods and walk alongside Tang Beck was probably the finest section of the walk. The Tang Beck path brought me to Bracken Bridge on the Hampsthwaite to Birstwith Road. A short way along the road I left it to follow the grandly named ‘Medieval Way’. A short-lived enclosed path leading to and from the back of the churchyard it is a lovely path which despite the name may in fact date back to Roman times. At the churchyard I turned left to a gate giving access to Nidd View, where a couple of benches are scenically sited next to the riverbank. Having taken advantage of this lovely spot to eat some lunch I then went to visit the war memorial which features the names of two of my great-great uncles who died in the Great War. 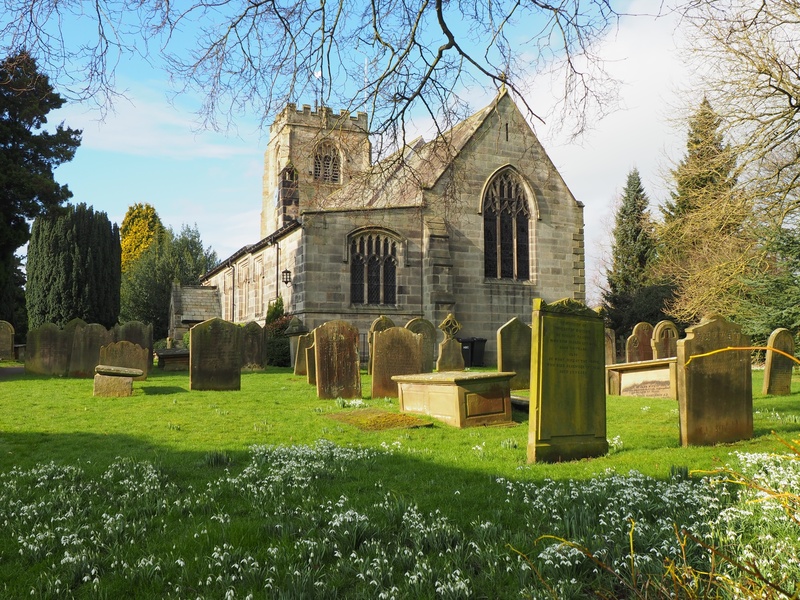 The graves at the front of the churchyard were covered in snowdrops, a truly lovely spectacle heralding that Spring is indeed on its way.